Are you dealing with shooting pains or numbness from sciatica? 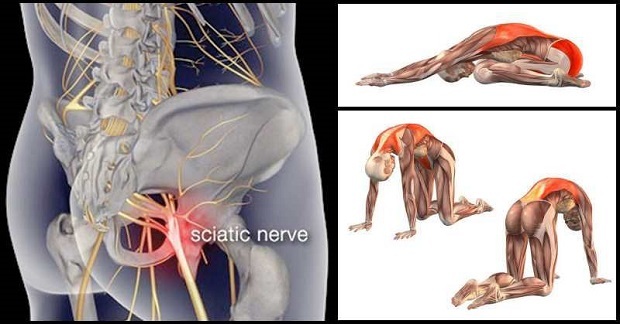 Discomfort is caused when the sciatic nerve (which runs from the lower spine down the back of each leg) gets pinched. It can be caused by an injury such as a slipped disk or pelvic fracture, pregnancy, or tight muscles in the lower back, hips, and legs. Whatever the cause, sciatica can be extremely uncomfortable, resulting in weakness, numbness, tingling, and burning, as well as moderate to extreme pain. With nerve injuries, you want to be careful not to irritate the nerve more than it already is, and the same is true with sciatica. Whether you feel yours at night or after sitting or standing for a long time, relief is just a yoga mat away with these eight poses. The goal is a gentle movement that doesn’t overstretch the nerve. If your sciatica symptoms are caused by sitting or standing for long periods, stretching the outer leg can offer instant relief. Stand on your hands and feet in Downward Facing Dog. Step your right foot forward between your hands, and rise up into Warrior 1. Open your hips, arms, and chest into Warrior 2. Place your left hand on your left hip, and stretch your right arm straight out, creating length through the right side of your body. Shift weight onto your right foot, and lift your left foot up. Plant your right palm flat on the ground under your shoulder. Distribute your weight evenly between your right hand and foot. Lift your left arm up, and gaze toward your left hand. Hold for five breaths, and then release the pose, coming into Downward Dog. Then try Half Moon on the left side. Creating some movement in the spine through twisting poses can relieve pressure from the sciatic nerve. As a bonus, this pose also targets the oh-so-tight piriformis muscle. Begin seated on your mat with your legs extended in front of you. Bend both knees and place your left heel as close to your right sit bone as you can. Cross your right foot over your left knee and plant it on the floor so your outer right ankle is next to your left knee. Reach your right arm behind you, and place your palm on the floor. Cross your left elbow over your outer right thigh to gently increase the twist. Gaze behind you and over your right shoulder, staying here for five breaths. Then release the twist, straighten your legs out in front of you, and do this pose with your left knee pointing up. This variation of Lizard pose will open a different part of your hip, as well as offer a nice stretch for the hip flexor, which can also contribute to sciatica discomfort. From Downward Facing Dog, step your right foot forward between your palms. Keep your hands on the mat, and lower your left knee to the floor, pointing the toes. Slowly lower your right knee to the right, so you’re resting on the outside of your right flexed foot. Keep your arms straight, pressing your chest forward just like in Upward Facing Dog. This will help encourage your hips to lower, increasing the stretch. Gaze forward, and enjoy this pose for five breaths. Strengthening the back muscles can offer relief, and here’s an effective and relaxing pose to try. Lie on your belly with your legs together. Place your arms by your sides so your palms are facing up. As you inhale, lift your legs, head, and upper body off the floor. Keep your hands on the floor for support. As you breathe, extend the crown of your head away from your toes, lengthening as much as you can through your spine. Stay for five breaths, and then release back to the mat. Take this pose as deeply as you want to target the areas of discomfort around your lower back, hips, and thighs. From Downward Facing Dog, step both feet together, and bring your right knee forward between your hands so your outer right leg is resting on the mat. If your hips are more open, inch your right foot away from you. Make sure your left hip is always pointing down toward the mat. Stay here with your hands resting on your hips or your right leg, or walk your hands out in front of you, allowing your torso to rest over your right knee. Hold here, breathing into any areas of tightness and tension, for at least five breaths. Then place your hands on the mat in front of you, tuck your left toes, and step your right foot back. Repeat Pigeon on the left side. This relaxing variation of Pigeon really targets the tight piriformis muscle, which is a common cause of sciatica. Lie on your back with both legs in the air. Place your right ankle on your left thigh above your knee. See the shape of the number four? It is there, just upside down. Reach your right hand through the open space created by your right leg and grab your left hand, which is reaching around the outside of your left thigh. Slowly bend your left knee toward your chest. You should feel a stretch on the outside of your right hip. After five breaths repeat on the other side. This gentle variation of Reclining Big Toe pose is done with a bent knee so you can really focus on stretching the lower back and hamstring of the leg that’s raised. Lying on your back, bend your left knee slightly and plant your foot on the floor. Raise your right leg into the air, keeping your pelvis grounded. Hold your lower thigh or place a strap over the arch of your foot. Keep your torso relaxed, and hold for five breaths. Some people will experience relief from engaging the glutes and hamstrings, so give this back bend a go. Begin lying flat on your back with your arms along the sides of your body and your palms facing down. Bend your knees, placing your heels as close as you can to your bum. With your palms and feet pressing firmly into the ground, lift your hips up. Keep your palms on the mat or clasp your hands together below your pelvis, extending through your arms. Or you can also bend your elbows and rest your hands on your lower back. If your feet are close enough, you can also hold your ankles. Stay here for five deep breaths, lifting your hips up as high as you can.